The director of the Center for Studies and Development of Cambodian Agriculture (CEDAC), Dr. Y. S. Koma, first tried SRI methods in 1999 after reading about them in an ILEIA newsletter article. During 2000, only 28 farmers participated in the SRI experimentation. Due to the early successes of SRI, the Cambodian government, especially its Minister of Agriculture, H.E. Chan Sarun, officially started endorsing and promoting SRI in 2005. Since then, SRI has been promoted in all provinces of Cambodia. Subsequently, SRI was included in the National Strategic Development Plan (NSDP) for 2006-2010 to raise productivity in the rice sector, and then in the revised NSDP for 2009-2013. On August 21, 2009, the Minister of Agriculture directed that SRI is to become a mainstay of the agricultural development for Cambodia. According to Mr. Ngin Chhay, director of MAFF's Rice Department, by the end of 2009 there were 110,530 farmers using SRI methods in Cambodia on 59,785 hectares in 4,534 villages; the average SRI yield was calculated at 3.48 t/ha, about 1 t/ha more than the national average. During the 2010 Annual Conference of the Ministry of Agriculture, Forestry and Fisheries (MAFF), the Minister of Agriculture, H.E. Chan Sarun, emphasized the importance of SRI in his opening speech and the Prime Minister Samdech Hun Sen spoke highly about the benefits of SRI for rice production in Cambodia in the closing ceremony. On July 6, 2010, the Cambodian Ministry of Agriculture, Forestry and Fisheries (MAFF) convened a meeting to discuss setting up a SRI National Advisory Board (SRI-NAB). CEDAC estimated that as of 2011, 100,000 families in Cambodia have applied SRI through the promotion of the Ministry of Agriculture, Forestry and Fisheries, their own NGO and other NGOs in Cambodia. During 2011, CEDAC promoted SRI to 75,395 families on 24,293 ha of arable area in 2,317 villages across 268 communes in 45 districts of 13 Provinces. As of 2012, CEDAC was reportedly supporting 140,000 farmer families in twenty-one provinces. CEDAC's president, Yang Saing Koma, was awarded the prestigious Philippines-based Ramon Magsaysay Award Foundation, largely for his work with SRI, on July 25, 2012. During the 4th National Farmers Conference (April 4, 2013), Chan Sarun, Minister of Agriculture, Forestry and Fisheries said that national paddy productivity increased from 2.74 t/ha in 2008 to 3.13 t/ha in 2012, with a good part of this increase attributable to wider use of SRI methods. The Ministry reports that at least 101,719 hectares are under SRI crop management, which means 150,000-200,000 households. Beginning in 2013, the System of Rice Intensification in the Lower Mekong River Baisn (SRI-LMB) project, which is led by the Asian Institute of Technology (AIT) and sponsored by the European Union (EU), partnered with Food and Agriculture Organization of the United Nations (FAO) and Oxfam America in collaboration with the Ministry of Agriculture, Forestry and Fisheries (MAFF) to enhance resilience of rain-fed regions facing climate change in Cambodia and several other LMB countries. 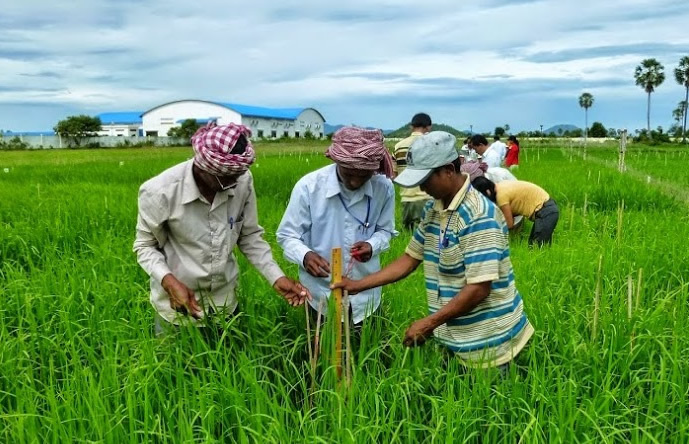 The regional project titled "Sustaining and Enhancing the Momentum for Innovation and Learning around the System of Rice Intensification (SRI) in the Lower Mekong River Basin (SRI-LMB)," works in Cambodia, Laos, Thailand and Vietnam. 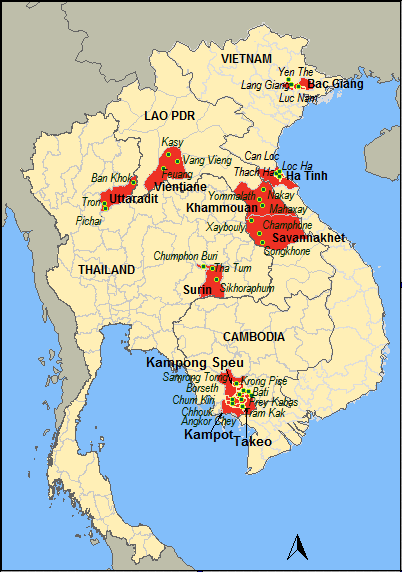 In Cambodia, provinces include Takeo, Kampong Speu, and Kampot. During 2014, CFPAR, a season-long intensive training on rice production, was implemented by General Directorate of Agriculture (GDA) of Ministry of Agriculture, Forestry and Fisheries (MAFF) Cambodia in collaboration with Asian Institute of Technology (AIT) and Food and Agriculture Organization (FAO). During 2015, CEDAC organized a national and provincial SRI Planter Championship 2015 to raise awareness of SRI principles and to demonstrate effective SRI methods. Winners will be announced in June 2015. A July 2015 article in Paddy and Water Environment concludes that the key factors for improving the degree of SRI adoption (in three rain-fed villages in southern Cambodia) are farmer zeal and careful attention rather than the home-to-plot distance and availability of labor. In conjuntion with the SRI-LMB Project, 170 Farmer Participatory Research (FPAR) were conducted in Cambodia from 2014 to 2016 with 3,393 farmers (2,061 women) involved. The Cambodian SRI-LMB experience was reported at the Regional Review and Planning Workshop of the SRI-LMB Project organized in Hanoi, Vietnam on 24-25 April 2017. Presentations entitled Monitoring, Evaluation and Learning (MEL) in Cambodia by Chuong Sophal and Key FPAR Learning and Draft Work Plans, Cambodia by Kong Kea highlighted Cambodia's project progress and lessons learned over the past several years. One hundred seventy Farmer Participatory Research (FPAR) were conducted in Cambodia from 2014 to 2016 with 3,393 farmers (2,061 women) involved. Seventy two post-FPAR were conducted from year 2015 until 2016 in three provinces namely Kampong Speu, Takeo and Kampot province involving 1,738 farmers (1,201 women). From 2014 to 2016, there were 680 participants (349 women) participated in seven FPAR Field Days. An Oversea Farmer Exchange Visit was made to Thailand in November 2014 by 10 participants. The project found that even though it was difficult to use all SRI principles with rainfed conditions, using even some of the practices improved yield and economic efficiency when transplanting or direct seeding was practiced. Additionally, FPAR farmers have built the skills to set up their own experiments in the future. [July 26, 2016] A recent article by Ly et al in the Wageningen Journal of Life Sciences investigated key factors influencing yields in a rain-fed lowland rice ecosystem in Cambodia under farmer’s SRI and conventional management practices (CMP). Variables contributing significantly to yield variation included: number of cattle (access to farmyard manure [FYM]), farmer’s SRI practices, planting density and soil organic carbon (SOC). These four variables explained 39% of variance in rice yield. Keeping other variables constant, rice yields were increased by 14% (458 kg ha−1) by shifting from CMP to farmer’s SRI practices. The change of one unit in cattle (head), hill density (hill m−2) and SOC (g kg−1) results in an increase of rice yield by 5% (153 kg ha−1), 2% (66 kg ha−1) and 9% (289 kg ha−1), respectively. The higher rice yield obtained by transplanting with narrower spacing suggests that the wider spacing recommended by SRI is less advisable in nutrient-poor soil. Although the application of manure did not emerge as a key variable, three out of the four key variables (farmer’s SRI, access to FYM, and SOC) are directly linked to its use. Farmer’s SRI was strongly associated with the use of FYM, and the plots that received more FYM and belonged to farmers with more cattle had higher total soil N. Total soil N was positively correlated with SOC. The results highlighted the important role of livestock in crop-animal integration and the contribution of animal manure to increase agricultural productivity within smallholder farmers on infertile sandy Cambodian soils. [July 22, 2015] An article by Ches and Yamaji in the journal Paddy and Water Environment compared distinct aspects of SRI labor requirements and conventional practices that could potentially lead to more intensive SRI adoption. A household survey and field observations were conducted in three rain-fed villages in the southern part of Cambodia: two in Kampot Province and one in Kampong Speu Province. Findings showed little or no difference between SRI labor requirements and conventional practices. Laborers are in high demand when preparing land and nurseries, transplanting seedlings, and harvesting. Hired labor costs depend on the supply of farmer-family labor and the efficacy of the ‘‘sharing-hand’’ system, not on farming techniques per se. This system helps alleviate hired labor costs, one of the highest cost factors. The findings also indicated that the degree of SRI adoption shows no correlation between the home-to-plot distance and availability of farmer-family labor or hired labor. The article concludes that the key factors for improving the degree of SRI adoption are farmer zeal and careful attention rather than the home-to-plot distance and availability of labor. (If you cannot access the full article, contact the authors or SRI-Rice for assistance). [May 8, 2015] CEDAC has been working with rice farmers in Cambodia since 2000 to develop and disseminate principles and methods of SRI. As of 2015, there are more than 200,000 rice farmers throughout Cambodia who have been using SRI principles to improve rice production. The best SRI farmers have proved that SRI methods enable farmers to increase their rice yields by two to three times compared to conventional methods while the reducing their requirements for seeds and other inputs. They also report less labor requirement for transplanting rice through improved planting techniques and skills. However, many farmers still complain that using SRI practices requires more labor, and transplanting only good seedlings one by one is complicated and risky. In order to encourage more farmers to plant rice using SRI principles effectively --especially to transplant only good seedlings one by one-- CEDAC is organizing the first SRI planting competition among SRI farmers, The SRI Planter Championship 2015. The objectives are: 1) to raise awareness among farmers about SRI methods and 2) to demonstrate more effective ways of crop establishment for SRI. The winners will demonstrate how quickly and at what low labor cost SRI crops can be established, and others can learn from the techniques that they have developed and use for themselves. CEDAC invites all interested farmers to participate in the competition, which will be conducted at two levels, namely, at provincial level and at national level. The best two SRI planters from each province (one man and one woman) will be invited to participate in the national competition. The three winners selected for national SRI planter awards and will receive the following: First prize: 250 USD, Second prize: 200 USD, and Third prize: 150 USD. The competition at provincial level will be conducted between May and June 2015, and the final competition at national level will be conducted around last week of June. CEDAC team in cooperation with the FNN will be responsible in organizing the competition in each participating province and at national level. The winners of the SRI championship prizes will be evaluated based on the performance of farmers in 1) uprooting seedlings and 2) planting them according to SRI principles. The criteria of the evaluation are as follows: -	Number of good seedling uprooted during 15 minutes’ time, and -	Time needed to plant on 100 m² and the quality of spacing. The standard spacing for the competition is 25 x 25 cm or 16 seedlings per m². CEDAC will organize an official ceremony to announce the winners as part of the national campaign to raise awareness on SRI. The winners will be invited to share their knowledge and experience with other farmers on how to plant rice with SRI methods most effectively. Videos of the national competition will be made for widespread circulation so that other farmers can see and appreciate the winning techniques. [January 2015] During November 2014, the Cambodian Television Network (CTN) broadcast a program on the Rice Dragon (Niek Srer), a weeding tool innovated by women farmers to reduce weeds in rice paddies. Several videos produced by Oxfam also describe the Rice Dragon (Niek Srer) weeder as well as the marketing campaign for it in Cambodia spearheaded by Oxfam to distribute it during 2014. (See Niek Srer Promotion Activities 2014 and No Weed, More Rice). The Rice Dragon was the eventual result of testing begun by the NGO Rachana in 2008. 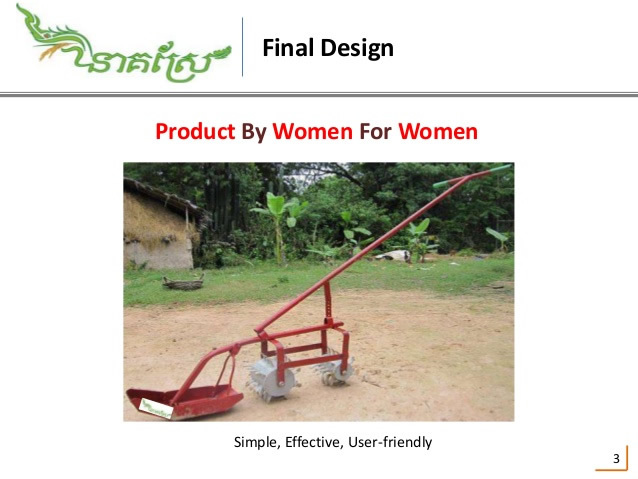 After farmers tried a number of models over the years, the Rice Dragon was finally selected by women farmers as the most effective, user-friendly design. During 2014, a Rice Dragon business model, which was assisted by Oxfam, was drawn up to include local fabricators, distributors (agri-shops, farmer champions) and farmers. The weeders are currently being promoted through radio, newspapers, leaflets, posters, banners, and billboards, as well as through SRI-NGO meeting and workshops. Sopheavy Ty, Deputy Regional Director for Oxfam America in Cambodia, made a presentation on the Rice Dragon at the Workshop on Crop Production Equipment for the System of Rice Intensification, held at the Asian Institute for Technology (AIT) in Pathumthani, Thailand, on November 1-3, 2014. The Rice Dragon was also on display at the SRI booth at the 4th International Rice Congress, held in Bangkok, October 27-31, 2014. [December 2014] The Director of Rice Department, General Directorate of Agriculture (GDA), Ministry of Agriculture, Forestry and Fisheries (MAFF) Cambodia, Mr. Ngin Chhay, addressed a closing and certificate award ceremony of Central Farmer’s Participatory Action Research (CFPAR) was held on November 28, 2014. CFPAR, a season-long intensive training on rice production, was implemented by General Directorate of Agriculture (GDA) of Ministry of Agriculture, Forestry and Fisheries (MAFF) Cambodia in collaboration with Asian Institute of Technology (AIT) and Food and Agriculture Organization (FAO). The project is part of EU funded and AIT-led Regional Project titled "Sustaining and Enhancing the Momentum for Innovation and Learning around the System of Rice Intensification (SRI) in the Lower Mekong River Basin (SRI-LMB)," that is working in 10 provinces of four countries: Cambodia, Laos, Thailand and Vietnam. 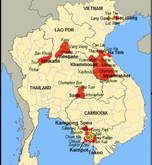 In Cambodia, provinces include Takeo, Kampong Speu, and Kampot. The field day held at the Agricultural Farmer Training and Research Center in Kampong Speu province marked the closing day of CFPAR and aimed to culminate and summarize the learnings from season long CFPAR activities. The various experiments set up at CFPAR provided opportunity to the farmer trainers to scientifically set-up experiments, collect observations and towards the end analyze the results (right). Concurrently, the farmers have started FPAR activities after the completion of CFPAR training and conduct field experiments. (For more information, see the SRI-LMB article on the field day). Since 2007, Japan International Volunteers (JVC) has promoted ecologically friendly agricultural practices in order to reduce the use of chemical pesticides and fertilizers which have a negative impact on the environment and those living in these areas. JVC has provided SRI training for 343 farmers in 2014. (See Japan International Volunteer Center article for details). [August 10, 2014] The Centre for Alleviation of Poverty through Sustainable Agriculture (CAPSA) in partnership with the Cambodian Center for Study and Development in Agriculture (CEDAC) facilitated a tour for smallholder representatives in Cambodia August 4-9, 2014. Participants included farmers, NGO extension workers as well as government officials from four Southeast Asian countries (Indonesia, Lao People’s Democratic Republic, Myanmar and Cambodia). The educational visit to Cambodia was held as part of the Network for Knowledge Transfer on Sustainable Agricultural Technologies and Improved Market Linkages in South and Southeast Asia SATNET Asia project. The participants, who had been invited based on their lead role in their respective communities, were exposed to good practices and technologies, including System of Rice Intensification (SRI), organic crop production/certification, and rice mill cooperatives. They took part in site visits to the Tramkork District in Takeo Province, Roleaphear District in Kampong Chhnang Province, and Phnom Penh. (See article on UN ESCAP website). [May 10, 2014] To reinforce SRI dissemination among farmers in Cambodia, CEDAC initiated a SRI national prize open to all rice farmers in Cambodia. During the 2013 rice farming season, 735 farmers registered to participate in the competition. After first round of evaluation at provincial level, 41 farmers from seven provinces were selected as finalists. On 6 May, 2014, CEDAC invited the 23 selected best rice farmers from seven provinces to participate in the final selection. The selection committee consisted of nine people, including three farmer representatives, two representatives from Provincial Departments of Agriculture and the General Directorate of Agriculture, one representative from the Kampong Cham National School of Agriculture, and three representatives from CEDAC. Three farmers were selected as best SRI farmers 2013: 1) Mrs. Nhem Sovannary, farmer from Po Preahsang village, Ta Pham commune, Tramkak district in Takeo province, yield of 7.33 tons per ha. 2) Mrs. Sarm Huot, farmer from Kantang Rang village, Rungroeung commune, Stong district in Kampong Thom province, yield of 5.6 tons per ha. and 3) Mrs. Voeun Tep, farmer from Bot Tasom village, Rungroeung commune, Stong district in Kampong Thom province, yield of 5.52 tons per ha. The yield achieved by best farmer for a fragrant rice variety was 7.33 tons per ha, while the yield of fragrant rice with non-SRI methods of cultivation is usually around 2 tons per ha. Farmers are often reluctant to grow fragrant rice as the yields are low even though it sells at a higher price. Thus, with SRI, farmers are more likely to grow fragrant rice for the market as they can get higher prices. The first best farmer received 3 cows, the second best farmer two cows, and the third best farmer one cow. The official ceremony to award the prizes will take place in August, 2014. For the 2014 season, CEDAC invites farmers to register for the competition for the ‘best SRI farmer’ award for this year. (See CEDAC article). Tech, Chey. 2006. Ecological System of Rice Inensification (SR) impact assessment in 2001-2005. SRI-Rice website (21p.,367KB pdf) [Assessment for the NGO CEDAC in Cambodia]. CTIP. 2016. Rice farming system equips vulnerable farmers to triple rice profits and decrease risk of trafficking. Counter Trafficking-in-Persons (CTIP) in Cambodia website. October 6. SRI-LMB project. 2015. Regional review and planning workshop (year 2015) for the project: Sustaining and Enhancing the Momentum for Innovation and Learning around the System of Rice Intensification (SRI) in the Lower Mekong River Basin (SRI-LMB). SRI-LMB website. May 2015. 2014. Central Farmer's Participatory Action Research (CFPAR) field day in Cambodia. SRI-LMB website. November 28. 2014. CEDAC. CEDAC organizes final round selection for best SRI farmers 2013. CEDAC website. May 10. 2014. CEDAC. Cambodian organic fragrant rice produced with System of Rice Intensification. CEDAC website. May. 2013. Technology Learning Exchange Partnership: Connecting successful solutions in sustainable technologies. CEDAC website. October 28. CEDAC. 2012. Yang Saing Koma - 2012 Magsaysay Awardee. Box website. Hirschbein, Maia. 2011. “Consumer Investing” Creates Opportunity for Cambodian Rice Farmers. Triple Pundit website. April 14. 2010. CEDAC exports organic rice. Deutscher Entwicklungsdienst website, DED in Cambodia section. Seang, Soleak. 2010. Yem Neang spreads the word on a new way to grow rice. Oxfam America. April 27. 2009. System of Rice Intensification (SRI) practice. Cambodian Farmers association Federation of Agricultural Producers (CFAP Cambodia) website. Perera, Andrea. 2008. Food on the table and savings on hand. Oxfam America website. October 20. Taft, Katie. 2008. Movie Helps Farmers Learn New "Language" to Grow More Rice. Oxfam America website. March 25. Pariphan Uawithya. 2005. SRI at work: higher rice yields for poor farmers. October article, Oxfam website. Deichert, Georg and Y.S. Koma. 2002. Experiences with the System of Rice Intensification (SRI) in Cambodia, a summary of an oral presentation at the conference Challenges to Organic Farming and Sustainable Land Use in the Tropics and Subtropics, October 9 - 11, in Kassel-Witzenhausen. Koma, Y.S. 2002. Experiences with the SRI in Cambodia. Paper presented at the international conference on Assessments of the System of Rice Intensification (SRI), April 1-4, in Sanya, China. Salvá, Ana. 2016. Desperate times for Cambodia's farmers. The Diplomat. August 9. Hufstader, Chris. 2016. Fathers: Some are not so terrible. First Person Blog (Oxfam America). June 16. ESCAP. 2014. What's ahead ESCAP: 16-31 August 2014. UN Economic and Social Commission for Asia and the Pacific (ESCAP) website. August 15. Hufstader, Chris. 2014. Leaving behind Cambodia’s troubled legacy. First Person Blog, Oxfam website. February 19. 2013. Cambodia hopes to accelerate niche organic rice export market. Oryza website. December 13. 2013. In Cambodia, Uphoff touts SRI successes, Cornell Chronicle, May 2. 2012. Magsaysay awardees teach farmers science and business, PhilStar, October 14. Ng, Jennifer. 2012. Ramon Magsaysay awardee pushes SRI for palay production, Business Mirror, August 28. Hufstader, Chris. 2012.For Cambodian farmers, poverty can be just one tragic accident away. Oxfam America blog. March 2. Yim, Sok Sophors. 2012. Rice Yield increased after applying the System of Rice Intensification (SRI). Yim Sok Sophors blog. February 17. Yim, Sok Sophors. 2011. Attitude change of farmer. Yim Sok Sophors blog. April 29. Yim, Sok Sophors. 2011. SRI Plan for 2011. Yim Sok Sophors blog. April 7. Yim, Sok Sophors. 2011. Case study of an SRI farmer . Yim, Sok Sophors. 2011. Yield of SRI vs Conventional Practices in 2010. Yim Sok Sophors blog. April 1. Yim, Sok Sophors. 2011. Ecological System of Rice Intensification (SRI) in Mondulkiri Province. Yim Sok Sophors blog. February 25. Tivea, Koam and Jake Schoneker 2010. From seed to sale. Phnom Penh Post (Cambodia). July 21. Seang, Soleak. 2010. Yem Neang spreads the word on a new way to grow rice . Oxfam America website. April 27. 2010, 2009. Yim, Sok Sophors. Various posts about SRI from 2009 and 2010. Yim Sok Sophors blog (WordPress). 2009. Cambodia to make first export of organic rice to U.S., Xinhua New Agency. Reposted on the iStockAnalyst website. November 20. Perera, Andrea. 2007. Feeding a nation. Oxfam America blog. October 1. Kunthear, Mom. 2007. Video shows how to increase rice yields. Phnom Penh Post. May 21. 2004. Imported growing methods sprout local farmer's collective. Source: Phnom Penh Post, Issue 13/13, June 18 - July 1. Tann, Huyly, Chaiwat Makhonpas, Aram Utthajadee, and Kasem Soytong. 2012. Effect of good agricultural practice and organic methods on rice cultivation under the system of rice intensification in Cambodia. Journal of Agricultural Technology 8(1): 289-303. Tsurui, Jun, Ymiji Eiji, and Sovannara Suk. 2010. Accepting System of Rice Intensification (SRI) by farmers in rainfed lowland paddy area of Cambodia. International Journal of Environmental and Rural Development 1-2: 129-135. Mao, M., P. Tongdeelert and P. Chumjai. 2008. The adoption of the system of rice intensification (SRI) in Tram Kak District, Takeo Province, Cambodia: The case study of leading farmers. Kasetsart Journal, Social Sciences 29:303-316. Video: 2015. (January 11). Niek Srer Promotion Activities 2014. Supachai Pitiwut channel, YouTube. 4:18. Video: 2014 (February 12). CODEGAZ agit pour les populations du Cambodge par la promotion du SRI. 49:48 min. CODEGAZVIDEO channel, YouTube. Video: 2012 (June 24). System of Rice Intensification. 45:01 min. veasna nida channel, YouTube. Video: 2010 (January 9). SRI Farming in Cambodia. Produced by Hermit Cave Films. 10:00 min. Permascience channel, YouTube. (Khmer language with English subtitles.) [This is a shortened version of the video originally created by Mind's Eye Productions for CEDAC, The Cambodian Center for Study and Development in Agriculture]. Video: System of Rice Intensification. Produced by CEDAC. 45.00 min. The Water Channel. (Khmer Language.) [Video about SRI in Cambodia]. Video: 2008 (November 6). Systéme de Riziculture Intensive - Cambodge: Le Riz du lLespoir. Produced by Corinne Lalo. 15:13 min. Tefy Saina website. Also published on the Daily Motion website. (French language). Soth, Kong. 2008 (Sept. 16): Neighbors Survey 'Rice Intensification' Gains. Audio podcast on Voice of America. PowerPoint presentation by Hour Sreng, East Asia Rice Working Group (EARWG) and Cambodian Center for Study and Development in Cambodia (CEDAC), at the ASEAN Food Security Conference, Singapore, June 16-18, 2010. 38 slides. - PowerPoint presentation by Ngin Chhay, Director of the Department of Rice Crop, MAFF, at the Workshop on Consolidation of SRI Experiences, Lessons and Networking, a national SRI workshop convened in Hanoi, Vietnam, January 21-22, 2010. 34 slides. - PowerPoint presentation by Heang Ratana, SRI Secretariat, given at the Workshop on Regional Knowledge Exchange on SRI: Producing More with Less Water held at Asian Institute for Technology, Bangkok, Thailand, June 22-23, 2009. 29 slides. - PowerPoint presentation given by Mr. Pin Vannaro Maharishi Vedic University . 26 slides. - PowerPoint by Chuong Sophal and Sras Phanny (supported by Cambodian Agricultural Research Fund). 88 slides. 2002. Experiences with System of Rice Intensification (SRI) in Cambodia. The SRI-Rice Cambodia Photo Collection that is running at the top of the page contains pictures obtained from Y.S. Koma (CEDAC), Norman Uphoff and others. (Click on the photo showing to enlarge it and to see captions). If you do not have Flash installed, click here to see individual photos which are made available on the SRI-Rice Picasa site.